Teaching the event of the Holocaust to middle-school students has three main objectives to be achieved. First, students should learn the history of the event. Second, they should remember the victims. 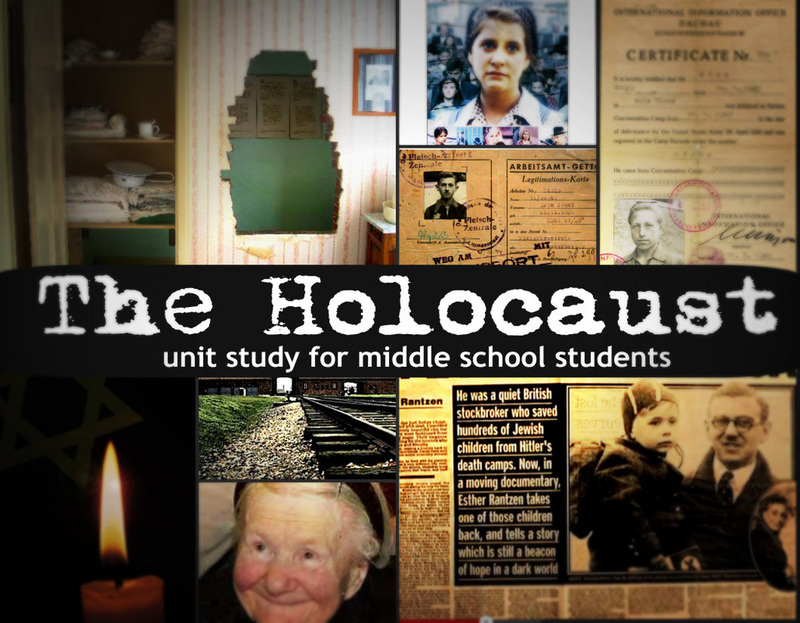 A third, objective (unique to this age group) is to examine how the events of the Holocaust relate to the students personally, in their lives and their communities today. The Holocaust was an event of mass prejudice and abuse of power. It entailed the murdering of many millions of people who were singled out for their differences, whether they be religious, ethnic, physical, political, social or national. Over six million Jewish people were murdered by virtue of their ethnicity and religion, while somewhere between five and sixteen million non-Jews were also murdered because they did not fit the homogeneous mold the Nazi regime had selected for the German nation.1 Explore the eyewitness interviews, lesson plans, and other resources in this collection to learn more about the causes and effects of World War II and its devastating impact on the Jewish population of Europe. A sensative and thought provoking lesson plan designed specially for middle school students. Holocaust Museum in Florida - 6 week unit study on the Holocaust Chronological Study broken into weeks showing the rise of dictatorship of Hitler, through the Rescuer who liberated the Concentration Camps. WORLD WAR 2 Unit study. Resources for a middle school or high school unit study. World War II began in 1939 with Germany's invasion of Poland. By the time of V-J Day in 1945, the conflict had encompassed the globe and become the most destructive war in history. The total loss of human life is estimated to be 40 to 60 million people around the world. Often listed as 'others' in history books - if mentioned at all there are millions of lives that were lost because of race, ethnicity and religion. Non-Jews of Polish descent suffered over 100,000 deaths at Auschwitz. The Germans forcibly deported approximately 2,000,000 Polish gentiles into labor for the Third Reich. The Russians deported almost 1,700,000 Polish non-Jews to Siberia. Men, women and children were forced from their homes with no warning. Transferred in cattle cars in freezing weather, many died on the way. Polish children who possessed Aryan-looking characteristics were wrenched from their mother's arms and placed in German homes to be raised as Germans. For the first 21 months after it began in 1940, Auschwitz was inhabited almost exclusively by Polish non-Jews. The first ethnic Pole died in June 1940 and the first Jew died in October 1942. Friedman tells us that, in addition to the six million Jews killed in the Holocaust, five million other people were systematically rounded up and killed by the Nazis. She gives us eleven personal accounts from some of those who survived. Here are the stories of some gypsies, homosexuals, Christian clergy, artists, political dissidents, the Czechs, Poles, Dutch and French. General Dwight Eisenhower inspected the Ohrdruf Nazi labor camp on April 12, 1945, while touring forward battle areas. It was the first camp in Germany liberated by the Western Allies. Eisenhower told General Patton shortly after his visit to Ohrdruf that he wanted “every visitor” in the region to see the camps. 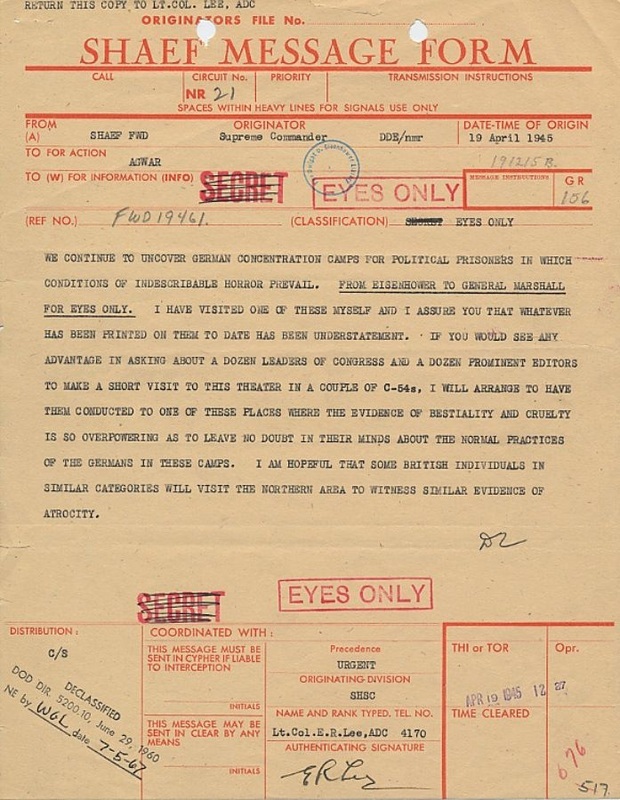 A day later he wrote General Marshall requesting that he send “about a dozen leaders of Congress and a dozen prominent editors” to tour the camps. Ike also ordered German civilians living near the camps to see the horrors firsthand. "I’m not going to let anybody ever say again that all these stories are just made up," Eisenhower told a reporter in 1965, twenty years after his order to publicize the atrocities. This was the first Newbery Award winner by Lois Lowry. For those of you who haven't had the pleasure of reading this very accessible novel within easy reach of fourth or even third grade readers, it's the story of the determination of the people of Denmark to get the Jews to safety while the Nazis were equally determined to annihilate them. Number the Stars by Lois Lowry. Students become acquainted with the threat to all citizens, especially to Jewish citizens, resulting from the imposition of Nazi authority and appreciate the courage exhibited by ordinary people acting out of conscience. Number the Stars by Lois Lowry. This review by Carol Otis Hurst first appeared in Teaching K-8 Magazine. Jack Mandelbaum had lived a comfortable life in Poland before the Holocaust began. After hiding for a while, his family was separated and Jack was sent to Blechhammer. This is his story of survival for three years at numberous Concentration camps. He is now the father to seven children and grandfather to more than a dozen. For sixth or seventh graders, the best approach might be through Jane Yolen's The Devil's Arithmetic (Puffin, 1990 ISBN 0140345353. This can be read aloud. The protagonist, Hannah, resents her family's preoccupation with the past and the Holocaust some of them survived. When selected to be the one to open the door for the prophet Elijah at the Seder, Hannah steps into the world of 1940s Poland. The concentration camp awaits. Johnston, Tony. The Harmonica. Illustrated by Ron Mazellan (Charlesbridge, 2004 ISBN 1570915474. Given a harmonica from his coal-miner father in Poland, the child learns to play it before he is taken from his family and sent to the camps. There he is ordered by the commandant to play Schubert. Even the beautiful music cannot hide or change the cruelty. Lakin, Patricia. Don't Forget. (Aladdin, 2002 ISBN 0689848099.) An eight year old prepares to bake a cake for her mother and collects the ingredients from various storekeepers, all of whom are Holocaust survivors. The child observes the numbers tattooed on their arms. Wild, Margaret. Let the Celebrations Begin. Illustrated by Julie Vivas (Orchard, 1996 ISBN 053107076X. The war is over and one young woman survivor at Bergen Belsen tells how she and the other women used scraps to make celebration toys for the children survivors just before liberation. Grade 5 and up Vos, Ida. Anna Is Still Here. (Puffin, 1995 ISBN 0140369090. The war is over. Anna has come out from the attic where she hid alone for three years. Now she is trying to adjust to a life that includes parents and friends. One of those friends is Mrs. Neumann who waits in vain for her daughter to return. Grade 5 and up Williams, Laura. Behind the Bedroom Wall. (Milkweed, 1996 ISBN 157131606X. Korinna is a loyal German citizen. She adores the Fuhrer and listens raptly to his radio addresses. Her parents encourage her participation in the Jungmadel, the Nazi youth organization. Then Korinna discovers that the sounds she has been hearing in her bedroom wall are not caused by mice, but by a Jewish woman and her five-year-old daughter. Korinna's duty is to turn them and her parents in to the Nazis. The Holocaust is a heavy topic and obviously prescreen any movie before showing it to your family. These shows do NOT have graphic scenes and it are great videos to watch to introduce the topic. The inspiring story of Englishman Nicholas Winton who helped hundred of children escape Nazi occupied Czechoslovakia. 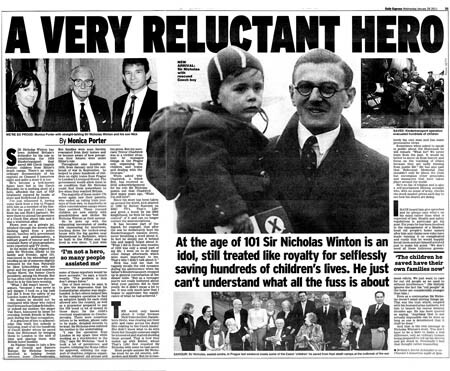 The documentary features interviews with the saved children (now elderly) and Winton himself as well as dramatic reenactments. The film’s plot unfolds as told through contemporary young storytellers who act as the omniscient narrators. They seamlessly transport us through 70 years of history and back and forth across three continents, and relate to us a story of unspeakable sadness and also of shining hope. For this is a Holocaust story unlike others. It provides a contemporary global perspective and lessons to be learned for a better future. I haven't found the movie streaming. Hidden in Silence is the true story of Stephania Pordgorska, a Catholic Polish teenager who had to decide wether to sit back and let Hitler's soldiers "liquidate" the Jews in her city or wether to do something about it. The story of Irena Sendler, a social worker who was part of the Polish underground during World War II and was arrested by the Nazis for saving the lives of nearly 2,500 Jewish children by smuggling them out of the Warsaw ghetto. *this was hard to watch since its directly related to the rescue of children. If the drama is too intense I would highly recommend watching these two documentaries. FIND OUT HOW STUDENTS MADE HER FAMOUS. There are abundant resources for studying World War II online. This is a gathering of the resources we used for our study combined created a free home school curriculum with no additional textbook necessary. Hands on and interactive we have included links to lesson plans and websites dealing with the war itself, the war in Europe, the war in the Pacific, life on the home front, the holocaust and the bombing of Hiroshima and Nagasaki. We have a complete listing of the History Channel Speech Archive's World War II speeches. Other resources include songs of World War II, activities, books, and videos. As a child I loved reading historical fiction from this time period, my daughter follows in my footsteps. She will be providing reviews of books as part of her lessons.